If all the suits were starting to look the same and you’ve been craving some nontraditional menswear looks, you’ll be happy to see the latest roundup of fellows that certainly marched to their own style beat. Robert Pattinson: For the ‘Good Time’ NYC on Tuesday (August 8), where he joined Chloe Sevigny, the actor dressed in a head-to-toe Dior Homme Spring 2018 ensemble that served up his slightly unconventional, nonchalant style edge in the bold stripes and the un-tucked silhouette. Machine Gun Kelly: Also at the Variety Power of Young Hollywood party, Machine Gun Kelly would not be missed in this monochromatic Calvin Klein Collection Fall 2017 ensemble that put its Americana, uniform-inspired leanings into a slightly more urban, rebellious light, with Uri Minkoff ‘Soprano’ sneakers completing the effect. 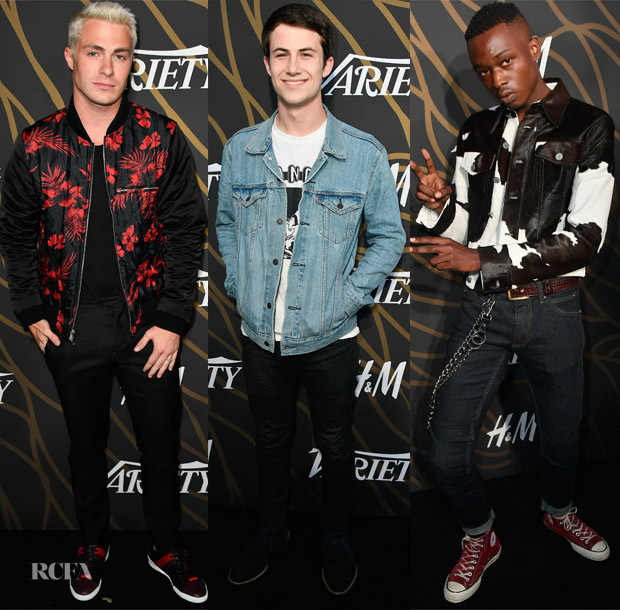 Colton Haynes: At the Variety Power of Young Hollywood party, Colton’s floral-printed black-and-red Dries Van Noten bomber jacket was like seeing the flip side of Algee’s. Yet, I loved that Colton kept his look more streamlined with black pants so that the bomber and his complementary shoes would take top billing. Dylan Minnette: Walking a more casual line at Variety Power of Young Hollywood, Dylan wore an iconic denim jacket with a printed T-shirt and black denim for a laid-back, cool look. Ashton Sanders: Clearly channeling his inner hip-hop cowboy at Variety Power of Young Hollywood, Ashton mixed a cowhide Calvin Klein Collection jacket with dark denim and classic, red Converse Chuck Taylor high-top sneakers. With the chains, this look definitely could have stepped right out of the ’90s.